In 2017, The Magnes acquired from Irvin Ungar, a private collector, the most significant collection of works by Arthur Szyk (Łódź, Poland, 1894  New Canaan, Connecticut, 1951) thanks to an unprecedented gift from Taube Philanthropies. Szyks works are now available to the world in a public institution for the first time as the Taube Family Arthur Szyk Collection. Irvin Ungar is the author of many publications on the work of Arthur Szyk, and most recently of "Arthur Szyk, Soldier in Art" (Giles, 2017), the winner of the 2017 National Jewish Book Award in the category of Visual Arts. This publication includes original essays by Michael Berenbaum, Tom L. Freudenheim, James Kettlewell, and Irvin Ungar. 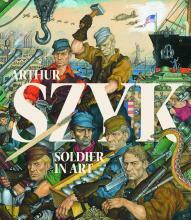 "Arthur Szyk, Soldier in Art" celebrates the diverse aspects of Szyk's career and examines his highly detailed artwork. The volume includes over 200 full-color plates of key works by Szyk arranged by theme, a timeline of Szyk's life, an extensive list of major exhibitions at museums and galleries, a complete bibliography of his illustrated books, and photographs of the artist. The presentation will take place in the auditorium of The Magnes, where high-resolution images of select collection items in the Auditorium of The Magnes present the public with an unprecedented insight in the many worlds of Arthur Szyk.